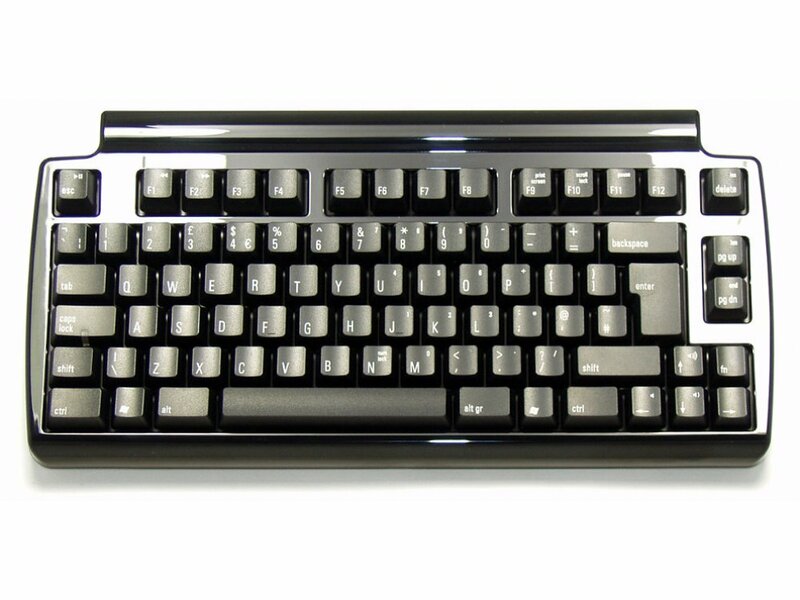 This keyboard is quiet enough to use in an open-plan office and feels good when typing. I was slightly worried about the layout, especially the function (fn) key placement over on the right side, but having used the keyboard for a while I now believe that this is one of it's best features. The placement of this key makes using the volume keys (on the cursor keys) and the home and end keys (on page up and page down) a one-handed combo. Someone should have thought of this years ago! The Alps (reinvisioned) keysswitches have a good professional quality and feel to them, and there are enough ports on the chassis to plug in whatever you need. The keyboard comes with 2 cables of differing lengths keeping your desk in order. And a nice detail is that the cable USB connecter is designed to work either way up (you *can* plug it in upside down or the right way up). The keyboard is also small enough and light enough to be carried in a normal sized backpack with a PC. Has worked flawlessly on Win10 and on Linux, including all the media keys and function keys like 'insert' etc. Overall I am impressed and would deiniately choose a Matias keyboard again. Got this for when working in an open plan office. Very quiet and excellent tactile feedback. A real programmer's keyboard. Service from KeyboardCo was very good indeed (again). This is an absolutely fantastic keyboard. My iMac came with the Apple Magic Keyboard which I don't particularly like because the arrow keys are ridiculously small. I don't like the keys on most mechanical keyboards because of how close they are together, but for whatever reason - it might be down to the curved design of the keys on the Mini Quiet Pro - it's a dream to type on, despite the keys being so close together. Each keystroke feels intentional and the switches are very tactile but quiet. You can easily feel the actuation point, whereas on an MX Brown, it's difficult to notice. It's what the MX Browns should be, both in terms of tactility and feedback. It's a good keyboard. It's probably the only one I could personally recommend, and I've tried many - Unicomp Ultra Classic, Varmilo VA88M, Filco Majestouch-2 TKL and the Cherry G80-3000. Excellent product, good switches, relatively quiet too. Best combination of size / noise / tactility. Very good tactile switches. And quiet. Inset number keys a bit confusing but probably won't use them anyway.